Input text: There is a deer. The deer is 10 feet tall. The ground is grass. The first bird is -.45 feet above and .23 feet to the left of the deer. The first bird is .8 feet tall. The first bird is facing the south. The second tan bird is -2.3 feet above and -.55 feet to the left of the deer. The second bird is 1.5 feet tall. The third black bird is -1 foot to the right of and -.8 feet above the deer. The third black bird is 2 feet tall. The fourth bird is -2.2 feet above and -1.6 feet to the right of the deer. The fifth white bird is -2.65 feet above and -2.5 feet to the right of the deer. The fifth bird is .9 feet tall. 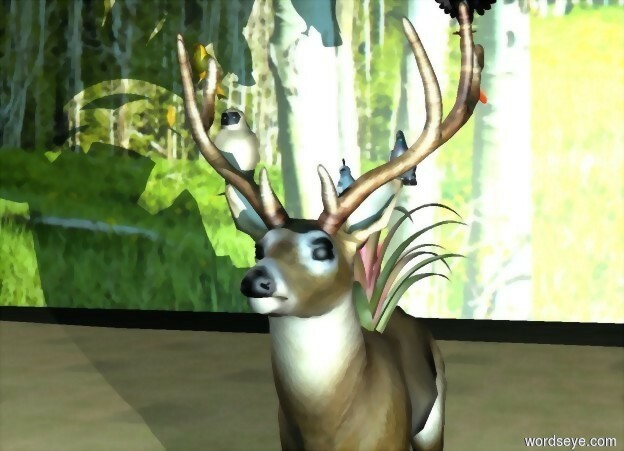 There is a 100 foot tall and 300 feet wide [forest] wall 60 feet behind the deer. The first flower is 5 feet in the deer. The first flower is 3 feet tall. The ground is unreflective. The camera light is sky blue. The ambient light is black. There is a light 2 feet in front of and .5 feet to the right of the deer. The light is 5 feet above the ground.